At Paint Along Studios, the more you paint the more you save. A Gift Pass Voucher is valid for a full year from the time of purchase. Gift passes will be emailed directly to you within 24 hours. During the holidays only, starting on Black Friday, you can purchase a physical Gift Pass at our location for a limited time during the holidays. Purchase a Gift Pass voucher in quantities of 1 or 5 Seats. The 5 Seat Passes give access to 5 Classes for the price of 4. They allow you to go to the class of your choosing during a year from the time of purchase.. 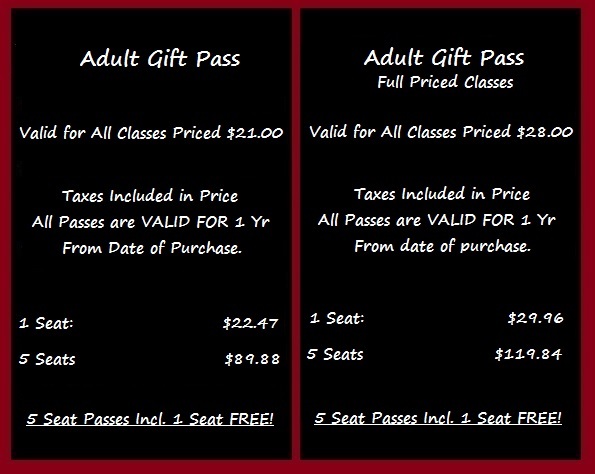 Gift Passes can be used in any combination i.e. a 5 entry pass can get 5 people into 1 class of 1 person into 5 classes etc. PASSES ARE NOT VALID FOR SPECIAL EVENTS. $21 classes are offered on Tuesday, Wednesday, and Thursday Only. $28 classes are offered on Monday, Friday, and Saturday Only.